Hello Noemi, Thanks so very much for sharing such an awesome pattern. I am working to get a few of these done as x-mas presents this year. I have a question about changing the yarn, I think that i should change to the “top” yarn for line 8 and above. I am not sure though, am I thinking correctly? BTW, my Mom has always crotched and i used to love the Doilies she made with the shell stitch. Again, thanks again for the pattern. Hi, Carmen. Thanks for stopping by and liking my pattern! You could try changing the color at row 8. The reason I changed it at row 7 is because it’s the first row for the top part of the cozy. I wanted to make sure that the color from the base wouldn’t be too visible when looking at the glass from the side. Thanks so much for getting back to me. I finished the project, I don’t think I did row #9 correctly thought. I am going to start another one and see if I do this one better. 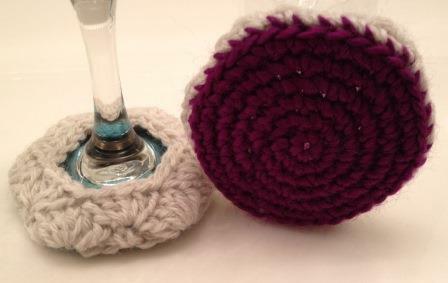 I love the wine glass cozy, but I’m having a problem with Row 8…is there a correction on the number of (6 shell clusters) I’m coming up with more than the 6 you stated.? 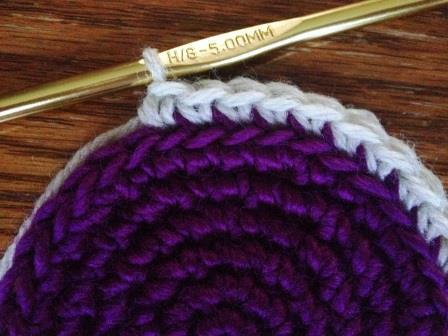 I should say that I’m relatively new to crocheting..so I might not be doing this row correctly. I’ll wait until you reply before attempting to go onto Row 9. I’m so happy that you’re giving my pattern a try! The first I would probably have you do is make sure that you end row 7 with 36 stitches. If yes, then the next thing I would have you do is make sure that you are skipping the correct number of stitches. You’ll start row 8 with a chain 1 that will count as the first single crochet, you then skip two stitches, in the next stitch you’ll do a 5dc shell, you’ll skip the next two stitches, and do your next single crochet. So it should be sc, skip 2 st, 5dc shell, skip 2st – this is over a total of 6 stitches so you’ll want to repeat it 5 more times over the remaining 30 stitches. where I’m making the mistake with this row. I do know that the cozy base is to large for the bottom of the wine glass..so I may need to do less rows for this pattern to work. I measured the bottom of the wind glass base and it’s (2 and 3/4 inches.) What size was your glass base? I truly want to make this pattern work and your help is greatly appreciated. I will try again probably later this evening and will keep in touch. I measured the base of my glass and it was 2 and 5/8 inches: so only slightly smaller than yours. You could switch to a smaller hook, that could help the base of the cozy turn out smaller. 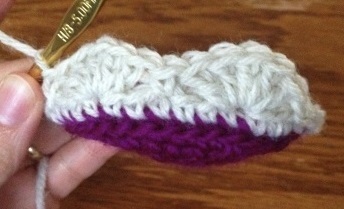 If you do end up having to do less rows to make the pattern work, then you’ll have less shells in the first shell row. So, let’s say you end up doing one less row in the base, you’ll have 30 stitches total. Then in your first shell row (which would now be row 7), you’ll have 5 shells and 5 sc. 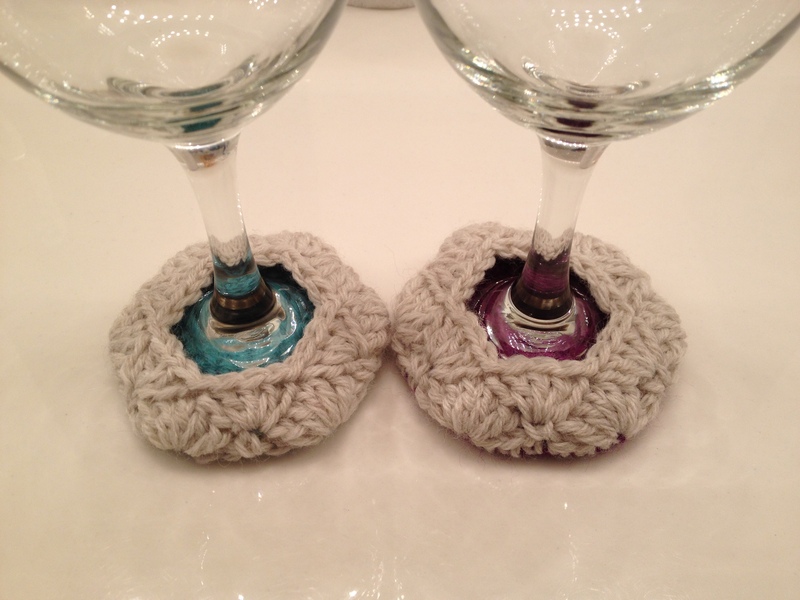 I can’t Thank You enough for getting me on the right track with the most Gorgeous Wine Glass Cozy pattern.. you designed and shared. I’m going to make a set of these for my daughter…I know she’s going to love them.